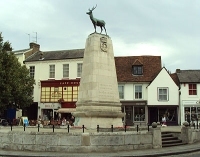 Situated in the South-West of the district, the County town of Hertford lies in a wide river valley in close proximity to its neighbouring town of Ware, from which it is only separated by The Meads and the A10 viaduct. The villages of Chapmore End, to the north, Hertingfordbury, to the south-west, and Hertford Heath to the south-east are also located close by. The confluence of the River Lea with the three others River Bean, Mimeam and Rib has had a marked past impact in influencing its evolution as a thriving centre, particularly in respect of the brewing and printing industries. The rivers continue to have an important effect in presenting both opportunities and constraints in shaping the future development of the town. Hertford has an extensive Conservation Area, which covers a large proportion of the town and includes areas with varying characteristics. The town centre itself retains much of its medieval core, including many listed buildings of historic significance, and has high townscape quality. This presents an attractive environment for leisure and business purposes, with its retail offer characterised by both major multiples and independent outlets. It has a chartered market which operates weekly on Saturdays and Farmers Markets, which operate on a monthly basis. The town also benefits from numerous cultural and recreational facilities, some of which include: its Museum; Hertford Castle and grounds; Hertford Theatre (which also has regular cinema screenings); and various facilities such as the Leisure Centre, tennis courts and skate park at Hartham Common. Background information about the city can be found on the council’s website http://www.eastherts.gov.uk/index.jsp?articleid=28044 Suppliers have access to details of procurement policies, procedures and information about support for local business. The website also gives further details of current tender opportunities. The Procurement Team are committed to the Localism Act and the Social Value Act when procuring. The In-Tend sourcing tool gives you access to opportunities that are published in accordance with the Public Contract Regulations and European Procurement Directives and the Council’s own Procurement Regulations. The Council publishes details of all spend over £500 and also it’s current contracts can be viewed on it’s website by searching for the Contracts Register.